It was in South Africa, where we tried bungee jumping and diving with sharks for the first time. Climbing the famous Table Mountain in Cape Town via the difficult India Venster trail was also a great challenge. 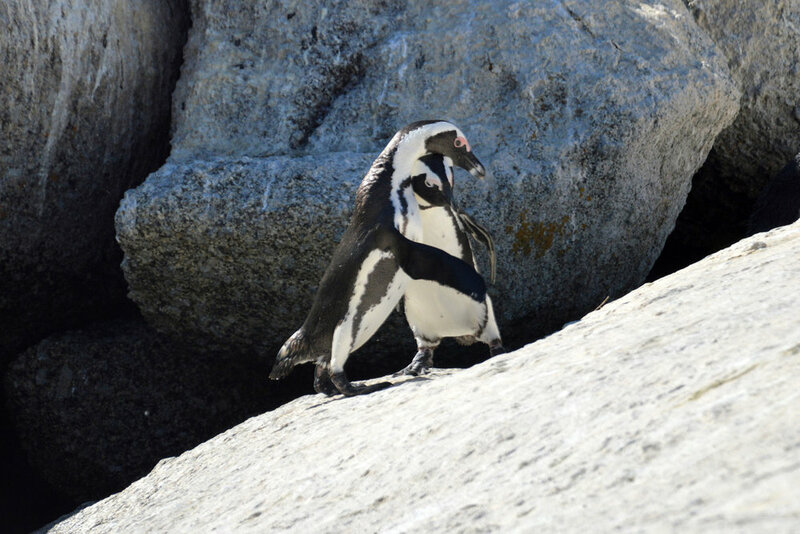 Apart from that, we enjoyed "the big five" on our first day in Kruger National Park, penguin beach near Cape Town and the breathtaking coast of the Cape of Good Hope. We also visited two city centers (which is quite uncommon for tourists in South Africa) - Cape Town and Johannesburg. They are somehow controversial regarding the safety issues - if you wish to find out how it turned out for us - see the articles below. We also went to the little country entirely surrounded by South Africa - Lesotho - which seems to be completely forgotten and ignored by western tourist. Don't miss it! More info about Lesotho here. Kruger Park in South Africa is one of the largest wild game reserves on the African continent. One of the must-see places in South Africa where you can see multiple wild animals roaming around freely. Sounds great - nature at its best - but what it is really like in real life? In this post you will find an honest review of our experiences in the park - all the pros and cons, how we managed to visit it in just 2 days (traveling from Johannesburg) and how lucky we were to actually see the "Big Five" and much more in just one day! Cape Town, South Africa's most famous city is extremely popular among visitors flocking to this beautiful country - especially that it's surrounded by nice beaches from one side, and from the other - spectacular (although not too high) mountains offering some amazing hike opportunities. However, what I've noticed is that many of the Westerners tend to see mostly the "posh" places around the city, such as the lavish waterfront, luxurious coastline or the most recognizable landmark - the table mountain. These spots are amazing indeed, but what about the very center of Cape Town? What's it like there? Why is it often omitted? How do the ordinary locals get by with their lives? And - the most important thing - is it safe to visit? South Africa is definitely a destination for adventure lovers. After climbing the Lion's Head and the Table Mountain, enjoying safari in the Kruger Park and the bungee jump on the way to the Blyde River Canyon, there was one more thing we'd always wanted to do - shark cage diving. It sounds dangerous but anyway, we thought you have only one life and decided to go for it. If, like us, before we did it, you'd wonder if the shark diving is like in those professional videos on youtube where the whole cage is submerged and the sharks are swimming all around you - the answer is no. In order not to be disillusioned, take a look at this post and I'll show you what it's really like. Johannesburg, the biggest city in South Africa has its share of bad reputation and, comparing to the extremely famous and attractive Cape Town, receives relatively low numbers of tourists. We would have probably skipped it too if it hadn't been for the super cheap last-minute flights from Europe (500 EUR return!). Johannesburg is nothing like Cape Town (take a look at my post about it) - there's no beach, no mountains, no architecture that could stand out, it's a very new city (a bit over a century old) and only looks nice seen from afar. If you come closer, the filth, poverty and chaos prevail in the streets. On the other hand, Johannesburg is an interesting point in the turbulent, recent history. It's the city of gold and the birthday place of Nelson Mandela. And, what most of the visitors come here for - it's a great gateway to the beautiful wild game reserves, natural wonders and... Lesotho - the little, forgotten country completely surrounded by South Africa.